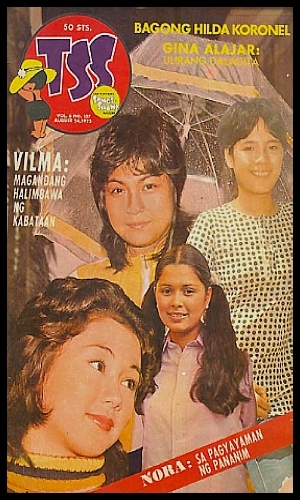 Hilda and Vilma’s only full length featured film, “Gaano kadalas ang minsan?” in 1982 was a record-breaking hit film, where Hilda plays Elsa, an impotent wife who desperately wanted to have a child. She concocted a plan to make her friend impregnated by her own husband, Lily played by Vilma Santos. The two agreed to be part of “Dugo at pag-ibig sa kapirasong lupa” in 1975 where they, together with Nora Aunor and other big stars like FPJ and Joseph Estrada, did not shared the same screen time but in separate segments. Currently, Hilda and Vilma’s husband shared the same name, Ralph. Hilda’s husband is Filipino-American businessman Ralph Moore, Jr. while Vilma’s Filipino politician, Senator Ralph Recto. Hilda and Vilma both have children from separate marriages. Koronel has 5 children, Leona (with the late-actor Jay Ilagan); Ivy (adopted); Isabel (with the late Bambi del Castillo); Gabby (with Spanky Monserrat); and Diego (with Dr. Victor Reyes). While Vilma’s children are Luis Manzano (with Edu Manzano) and Ryan Christian Recto (with Ralph Recto). Both Vilma and Hilda were once linked to the late Jay Ilagan. Hilda had a child with Jay and it was public knowledge that Jay courted Vilma when they’re both in their teens. Both did several films with him, most notably, “Kasal” and “Happy Hippie Holiday” for Hilda; and “Sister Stella L.” and “Remembrance” for Vilma. In 2003, Hilda plays Aling in Mark Meily’s dramedy, “Crying Ladies” with Sharon Cuneta. Although not a Vilma Santos film, Hilda Koronel’s role has a connection to Vilma. She plays, as the New York Times film review explained, “…a shopkeeper who clings to the fading memory of her movie career, whose high point was a bit part in a picture called ‘Darna and the Giants…” “Darna and the Giants” was of course a Vilma Santos film. According to Ricky F. Lo on his August 3rd Philstar colum, being second choice for a role is as, “It happens all the time…second choices turning out to be, after all, the better choices.” He pointed out, Hilda Koronel as the second choice for Lea Productions’ “Haydee.” It was turned down by beauty-contest finalist Marilou Destreza, who later co-starred with FPJ but faded after that. Then Vilma Santos was the second choice for Celso Ad Castillo’s “Burlesk Queen.” It was initially offered to Lorna Tolentino. In 1979 Vilma Santos did Pinay American Style where her role’s named was PX, an illegal alien in the U.S., three years after, Hilda Koronel played Lydia in the Lino Brocka film titled, PX. Lino Brocka’s “Insiang” starring Hilda Koronel was the Philippine’s entry to the prestigious Cannes Film Festival in 1978. After seven years, Mike de Leon was supposed to repeat Brocka’s success with two of his films exhibited in the previous year’s Director’s Forthnight section of the festival, but unfortunately, it didn’t happened. Instead, de Leon’s film, “Sister Stella L.” was entered as the Philippines’s entry to the oldest festival and equally prestigious, the Venice Film Festival in 1985. This entry was posted in ARTICLES and tagged ARTICLES, Hilda Koronel, Vilma Santos and Hilda Koronel. Bookmark the permalink.